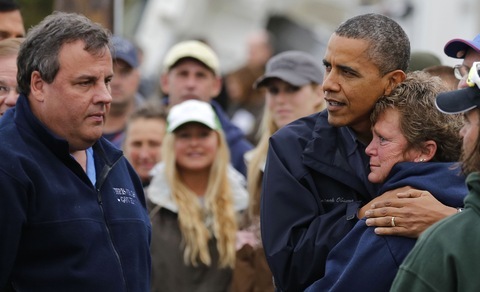 President Barack Obama hugs North Point Marina owner Donna Vanzant as he tours damage done by Hurricane Sandy in Brigantine, N.J., October 31, 2012. On Sunday, President Barack Obama spoke from Moore, Okla. He stood in front of neighborhoods shattered by last week’s deadly tornado and offered support and comfort to the families and communities just beginning to rebuild. Just three weeks ago the president spoke at the memorial service for 15 volunteer firefighters who were killed in the fertilizer plant explosion in West, Texas. Days before, he delivered an uplifting speech at an interfaith church service in Boston for those killed and injured in the Boston Marathon attacks. …this is a relatively new role for presidents, one that reflects not just the emphasis on an ability to communicate and express empathy, but also an increase in power to direct the federal government to assist in recovery. Tonight on the PBS NewsHour, historian Michael Beschloss and political reporter Alexis Simendinger consider the evolving responsibilities of presidents during times of national tragedy. Below, we’ve created a playlist of President Obama’s appearances after the tragedies in Newtown, Aurora, Tuscon, Boston, West and others.